Arkle and jockey Pat Taaffe. Arkle the steeplechaser was and still is a household name in Ireland. Born in 1957 the bay gelding was owned by Anne Grosvenor, Duchess of Westminister, and trained by Tom Dreaper of County Meath, Ireland. His jockey was Patrick “Pat” Taaffe a National Hunt jockey who rode Arkle to win three Cheltenham Gold Cups between 1964 and 1966. Arkle’s ability on the racecourse did not come by accident; his grandsire was the famous Nearco (1935-1957) considered by Thoroughbred Heritage as, “one of the greatest racehorses of the Twentieth Century” and “one of the most important sires of the century.” Some of Nearco’s descendants were ranked among the Top 100 U.S. Racehorses of the 20th Century by The Blood-Horse and include such esteemed horses as Secretariat, Seattle Slew, Ruffian, Northern Dancer, and Shergar. His first victory was at Cheltenham by 20 lengths in the Broadway Chase. 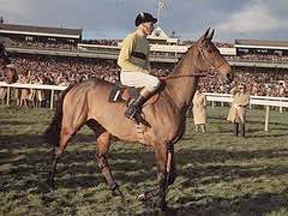 A horse called Mill House beat Arkle in the Hennessy Gold Cup at Newbury in 1963, but Arkle got his revenge in the 1964 Cheltenham Gold Cup by winning by five lengths. This was to be the last time that the mighty Arkle did not start a race as favourite, and perhaps because of the competition, there were only two other horses in the Gold Cup that year. Then, because of his superior performances, the handicapping systems had to be altered for the Irish Grand National. There would be two sets of weight systems: one for races where Arkle was entered, and a second set of rules for when he wasn’t. While Arkle only won by one length, it must be noted that he was carrying 35 extra pounds. In 1965 Arkle won the Gold Cup yet again beating Mill House by an incredible 20 lengths. However the following year, he won again by an amazing 30 lengths even though he ploughed through one of the fences. Always giving a race his all, he never failed, and despite a quirk that saw him crossing his front legs over a jump, he was again victorious. Statue of Arkle at Ashbourne, County Meath, Ireland. Peter O’Sullevan, racing commentator, called Arkle a freak of nature and “something not likely to be seen again.” Sadly in December of 1966, his hoof hit a guard rail during the King George VI Chase, but the horse gamely finished the race with a broken pedal bone. He still came in second. He did recover but never raced again, and was used as a hack by his owner. He died at the early age of 13 from advanced arthritis. There are all kinds of wonderful stories surrounding this horse and he attracted a devoted following. Some people said he was so good because he drank Guinness beer two times daily, and thanks to the popularity of racing on TV, he was attracting lots of media attention. He became a star and gained a following just like the Kennedy’s, the Beatles and other celebrities and stars of that era. His fan mail arrived labelled simply, “Arkle Ireland” while others addressed his mail by writing: “Himself, Ireland,” as the name “Himself” had been bestowed upon him. People sent him treats to eat, Guinness beer to drink, and people prayed for his recovery after his accident. He was called ‘a saint’ by work rider Paddy Woods and children were allowed to ride the horse, so kind and gentle was he. Racing fans recognized that he was incredible, not only thanks to his fluid galloping, and exuberant jumping, but that he did so usually carrying extra weight. Arkle finished first in 27 of his 35 races, but his most outstanding race, and the one which elevated him to almost mythical proportions was the Gallaher Gold Cup run at Sandown in 1965. 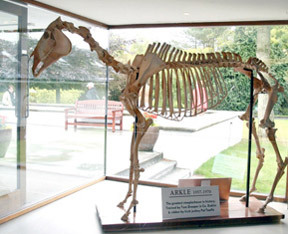 Arkle skeleton at the National Stud, Ireland. Mill House was his chief rival in the field of seven, and was supposedly fighting fit after Arkle had trounced him in the 1964 Cheltenham Gold Cup. Mill House was carrying 16 pounds less than Arkle so it was any man’s race. Arkle had other ideas, and the crowd got swept away even before the race began. As the two favourite horses made their way to the start line in the autumn air, the clapping began slowly and quietly until everybody on the course joined in and created a loud crescendo of cheering and yelling. 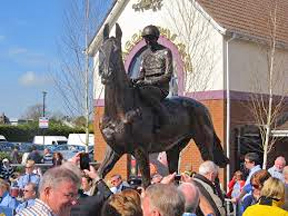 Arkle was entered into the British Steeplechasing Hall of Fame in 1994, and a life size statue of him was erected at Ashbourne, County Meath, Ireland in April 2014. His skeleton is a popular exhibition at the Irish National Stud near Dublin City, Ireland. Arkle was given a time form rating of 212, the highest ever given to a steeplechaser. Mill House by comparison was rated at 191. Thank you so much for this article. Arkle’s picture has been hanging on my wall ever since I was a kid!! !